Everyone is looking for The Witness. Some want to kill him, some want to serve him, some want to save him. Also Titan has developed splinter suits. 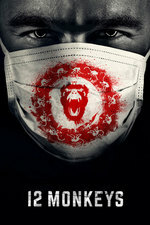 All 10 episodes of Season 3 were presented over 3 nights on SyFy. Jennifer Goines is slightly less crazy this season but no less awesome. Only seen the first ep this season; I had thought that the show was irrevocably broken from messing with time too much, but they introduced at least one plot point that changed some basic rules. I've liked this adaptation and I think I'll stick with it to the end. Hopefully there's a reasonably satisfying conclusion. Agreed, Emily Hampshire in the Goines role continues to be fantastic! I really enjoyed this season. I binge-watched it yesterday and today and enjoyed it more than the first two seasons. I may have more to say later. lol love the tags list! I dunno. I felt like the show went off the rails awhile ago and never got back on track, substituting smart sci-fi with body counts and blood. I've caught a few episodes of this season (including this one) and remain underwhelmed. I thought this was going to be the final season, but apparently there's yet another season coming next year. I spoke too soon re: Hampshire/Goines. I'm likely wrong, but I had a strong feel that the writers were "Yep, we aren't getting another season, lets have a couple of fun episodes." resulting in the heist ep (05, which I thought was really charming, got a kick out of the costume department trotting out 80's stuff, and Hampshire was fantastic - this ep and all season; she's the real star of the show) and the Cass/James ep. Then they got word they were renewed resulting in the last two eps that cast someone who looked far too much like Ramsey at first. Yeah, too many guns and they couldn't even do mass combat well. That said, some of the hand to hand is ok (and a bit funny - James/Deacon on the train), and I liked how we're reminded that even the protagonists aren't necessarily "good" people. The self destruct/purge thing with the new tech was overused a bit and was kind of weak on the face of it. The whole superdark visual filter is a bit annoying, although I have to admit it looks great on an IPS panel, but I guess it saves a lot on set costs. All of the charcoal drawings are fantastic. I don't like the differential rates of experiential time between individuals, but necessary for the plot. I always thought that 1 minute is 1 minute no matter where you are on the timeline was a thing (implicit by the "realtime" monitoring of travelers' location by the ground crew). Even the veneer of continuity is completely unmoored now, but its been heading here all along. So, another SciFi show on Syfy turns into another Fantasy show on Syfy. That said, I wish they had more characters appear/disappear between episodes unexplained (because of a change in the past, a la Jone's bf) or more "WTF, no, it didn't happen that way" or "arguments about song lyrics" conversations. But that would have been hella confusing. I get the themes they wanted to emphasize this season, in a grade-school book report kind of way, but... <shrug> there wasn't a lot of meat. Would have been totally fine with a Show Finale e09 e10 rather than the season finale here. I rewatched S3 in anticipation of S4 - I thought it doesn't drop until July, but ep 4 airs tonight.